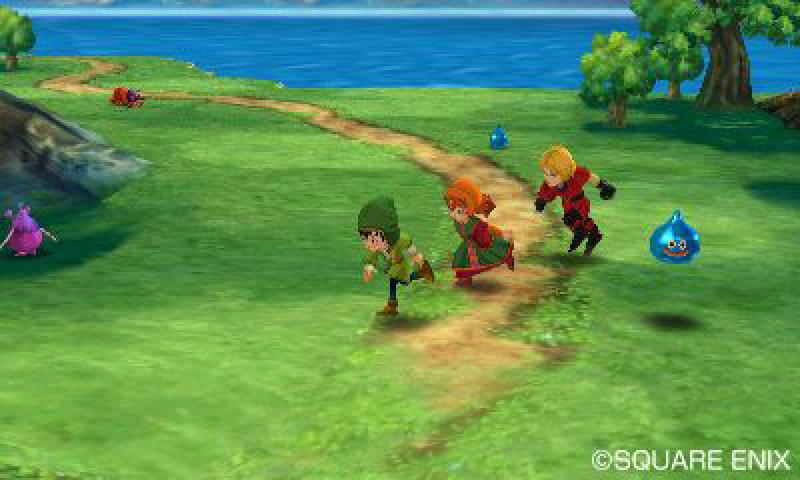 Nearly four years after its debut in Japan, the 3DS remake of Dragon Quest VII: Fragments of the Forgotten Past finally arrives in the U.S. in a few weeks. We spoke to Yuu Miyake, executive producer for the Dragon Quest series, and Noriyoshi Fujimoto, the producer for DQVII's remake, about the philosophy they've adopted for recreating and relocalizing such an absolutely sprawling RPG. USgamer: Between this and Dragon Quest Builders, you have two very different takes on the franchise due this fall. What philosophy do you use when working in these different modes of Dragon Quest? The main games, the side stories, the remakes. Each of these are different. What do you bring to each game? Yuu Miyake and Noriyoshi Fujimoto (Square Enix): With Builders, we've kind of touched on this before, but the market is getting larger. There are many other platforms — it's not just the consoles, now we have mobile. So, the customers and the fans are kind of spread in these different platforms, and we're trying to bring them all together through these titles. In terms of remakes, because the original Dragon Quest VII was released on a different platform, there are many fans now who aren't able to play that original game. So, we put that into consideration for different consoles, and again basically bring those fans together. Remakes need to be optimized for every single title, which is why we haven't published Dragon Quest games on services like Virtual Console. Really, whenever we release a new title — right now, we're working on Dragon Quest XI — we try to gather all those fans that are spread apart and bring them in to wherever the new type of game will be. 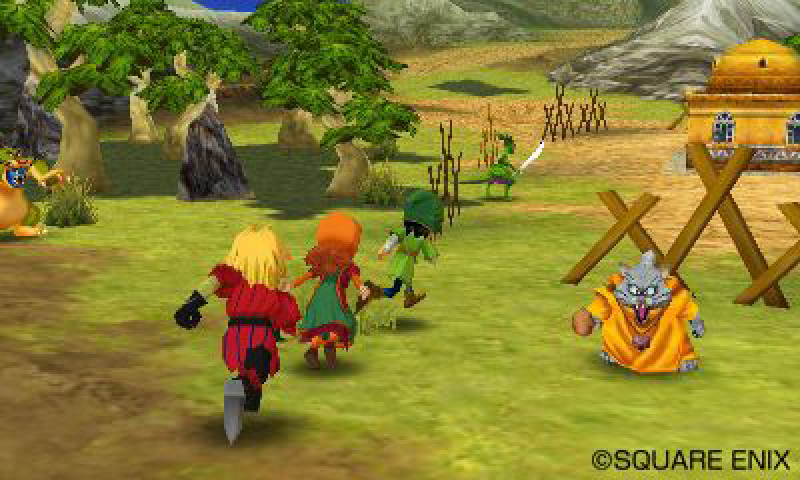 USG: How does that philosophy apply specifically to Dragon Quest VII? 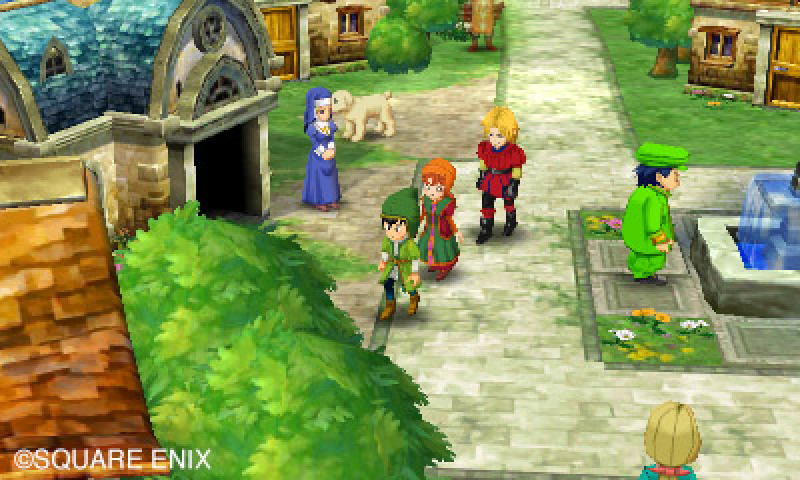 Square Enix: Back in 2001, we released the PlayStation version of Dragon Quest VII [as Dragon Warrior VII]. It also came out as an English-language release, but because in remaking it for 3DS we've reorganized. We've restructured our approach to localization since we Dragon Quest VIII. So, we apply that new philosophy back to the older game, DQVII. Do you want to hear about the Japanese version concept, or the overseas version concept? USG: Both, really. DQVII was a very very popular game in Japan, one of the most successful in the series. I'm curious how you approach it for the home audience that already loves the game, versus the American audience, which... there wasn't a very big audience at that time for Dragon Quest. It had been forgotten by a lot of Americans because the series hadn't been localized for so long at the time. Square Enix: For the Japanese version, we decided, after 10 years, to produce a remake. For the longest time, we didn't think we could remake DQVII, because the game was so big. So, we kind of went back and forth, back and forth for a while. We weren't really sure how to revitalize the game. Should we add new content? Should we change how the game would be presented to players? When 3DS was announced, we realized that users would be able to basically pick up and play for a little bit, which made a really good match for how Dragon Quest VII plays out — it's is a sequence of short stories. We realized that if we didn't take this opportunity and run with it, then we wouldn't be able to create another remake, so we decided to do this. 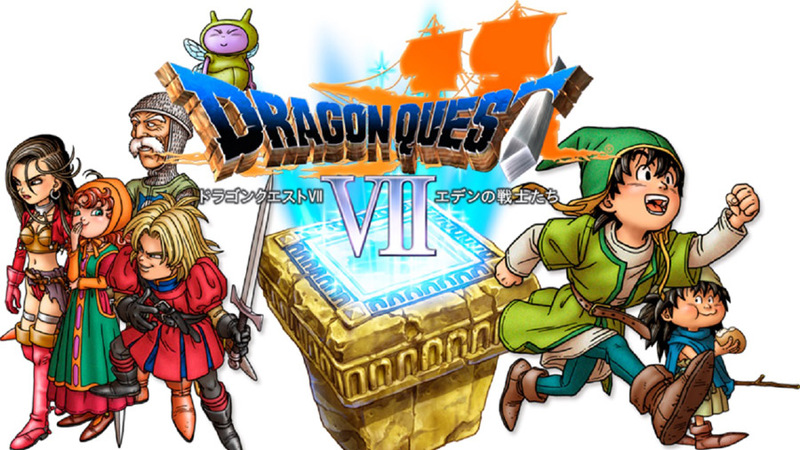 Up until Dragon Quest VI, it was very easy to do a remake... but Dragon Quest VII, because it was so large, we were a little bit hesitant at first. And we also wanted to respond to the Japanese fans who were so used to getting remakes, they were able to get the remakes of Dragon Quest IV, V, and VI, and so they were like, "Where's VII"? We really wanted to answer to that need. For the U.S. and European versions, there were a lot of fans that were requesting the remake, so we decided to localize it as well. Because of the business side of it, we actually didn't have any plans to create a remake of DQVII for the longest time, but a lot of fans used Facebook and social media and approached us and requested us, so we decided to move forward on that. And then, we were also able to get support from Nintendo, so we were able to do this as well. USG: One of the things that really surprised me back when I imported the remake was the visual redesign. Dragon Quest IV, V, VI on DS... those remakes took the older 2D games and made them look technologically, in terms of visuals, very much like Dragon Quest VII did on PlayStation. Instead just carrying forward that style for the actual DQVII, though, you gave it a total overhaul, so it has much nicer graphics and more immersive 3D. Square Enix: DQVII has the most magic, attributes, and jobs in the series, so we really wanted to reconsider how the users could have fun with it. One of the biggest additions, one of the things we wanted to show the fans was, how fun it was to change the occupations. To enhance that, we added different animations for these characters, for critical hit motions and whenever they change occupations, so there's unique animations for each of them. We wanted the users to enjoy and experience these types of new additions through graphics by changing jobs and adding this new element. With Dragon Quest IV, V, and VI, the same developer worked on those remakes, ArtePiazza. And this was the same for DQVII, where the original dev company actually created this. So, we feel like we were able to circle back and do the best we can for the 3DS platform. USG: But it's not just the visuals which have changed for this remake. I played the first few hours of the import version, and, the beginning seems different from the original PlayStation version, much faster. Can you talk about how much the actual play has changed, and how you came to the choices that you did in terms of changing content and changing up the flow of the play and so forth? Square Enix: One of the biggest things that we wanted to do... a lot of the players of the original Dragon Quest VII could not go to the ending. They could not complete the game. We heard a lot of feedback from the fans that they couldn't find the tablets, or that the puzzles were too difficult. So, in terms of puzzle, we kept the essential puzzles, but for the other ones, we've sometimes gone and deleted them or revitalized them, and overall made everything a little bit more compact. And in terms of story, there were untold stories in the original version, so we did add a little bit of that into the main game. We focused on the functionality... well, not functionality, but the benefits of 3DS, where users are able to pick up and play. We tried to create more of a bite-sized story, where users would be able to pick up and then finish that sequence and move on to the next. We've also rebalanced the battle system. In the original version of the game, you had four or five vocations, and then there were 54 jobs total within those vocations. We noticed that a lot of users were only using a few of those job, and we felt it was a shame that they weren't able to experience them. So, we realized that we wanted players to be able to change jobs as much as possible so they could experience all the different types of jobs and the special abilities for each. In order to change jobs you need to complete a certain number of battles, so for the remake we decreased that number, meaning that players will be able to change jobs a little bit easier. There's also that little creature at the very top left corner [of the box art] — that is a new character that was introduced in this title that [character designer Akira] Toriyama created. Part of the feedback we saw following the original game was that players weren't able to find all the tablets [necessary to unlock new areas of the game]. So we created this new character. He's a little spirit, a faerie, and he introduces a beacon that flashes when the players are close to a tablet. So, they'll be able to find it more easily. USG: It seems like that's always the real challenge of remaking a game that's so well-known, so well-loved — making it more accessible without losing the original character of the game. Square Enix: Whenever the players think back on the original version, they tend to beautify the game a little bit more in their memory than it really was. So, whenever we create a remake we have to make that perception into a real, actual thing — we have to bring the game to that level. We have to create a game where we want the users to forget all the hardships that they had in the original version, like, oh, I couldn't find the tablet, or I couldn't do this. We have to streamline the experience. The best compliment that we can receive from the fans, when they play a remake is, "Wow, nothing has changed!" But, in reality, there's a lot of changes that were put into it. Then, we can showcase the very visible changes and then let them know that it's not exactly the same. USG: So, with remakes of DQVII and VIII and the Monsters games, you've pretty much caught up to the modern era with Dragon Quest remakes. Do you see a future in remaking other games in the series, or do you feel like that aspect of the franchise is pretty much done for the time being? Square Enix: I think that when there are new consoles or a new market, then we'll definitely consider new remakes. Tagged with 3DS Handhelds,	Interviews,	Nintendo,	Retro,	Role Playing Games,	Single Player,	Square Enix.